Dragon's Breath. This is a purple that leans very red and it's studded with multicolored glitter. The glitter in this is very fine, and you can see a lot of different colors in it. When you step outside with this polish on, it practically starts on fire! I mean, not literally of course, but the flash and fire from the glitter is breathtaking. Very cool polish, very cool name. Frosty Meadow. This is a light, fresh, slightly blue-tinged green with a slight jelly texture and very fine silvery blue glitter. Like Dragon's Breath, the glitter in this polish is very fine but it packs a punch. 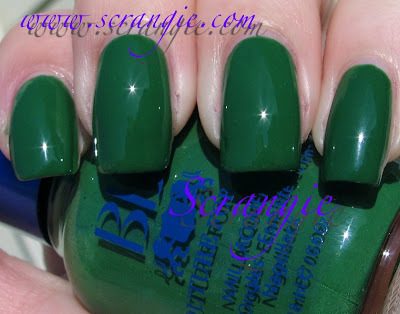 It's a very spring-like green but unlike other spring shades, this one has personality! Poison Ivy. A medium green creme. There can never be enough green cremes! This one is kinda strange- it looks at least a shade lighter in the bottle than it does after it dries on the nails. I've seen this happen with a lot of polishes before, but rarely with greens. It's also a little bit dull without a topcoat. I adore the color and I'm dreaming up all sorts of good layering combinations to go with it. Sea Of Cortez. One of the most beautiful polishes I have ever seen. A bright blue jelly with super fine pale green glitter. Even if you're not into glitter polishes, you still have to be able to admire the beauty of this polish. It's just.... mesmerizing! In fact, after I took this picture I left the polish on and I'm still wearing it! I might need a backup! Overall, I am really loving BB Couture. For a brand I've never heard of and know absolutely nothing about, they sure shocked the hell out of me with their awesome colors! Formula-wise, these polishes aren't perfect. They have three-free syndrome, being both thick and runny at the same time. Poison Ivy was particularly difficult to apply, it wasn't the smoothest creme I've ever used. This issue with the formula is easily fixed with a little bit of thinner, so I don't mind. The colors are worth the slight difficulty of application. They do dry very quickly and they seem to wear well- no basecoat or topcoat and I still have no chips or tipwear. The line seems to be comprised of a lot of boring pinks and reds, but with a few awesome colors like these tossed in there. From what it looks like, each new collection is more and more interesting, so maybe there will be more amazing colors like this in the future. I know I'm definitely going to try more of these polishes. They are awesome, and the fun colors they have are not like any others I own. I admire companies with unique colors, and BB Couture For Nails has definitely earned my love and admiration! omg Sea of Cortez is gorgeous! I want that one soo bad now. Those are 4 of my favorites from BB Couture! I have a ton of other colors and really like all of them. Sea of Cortez is so freaking amazing. I hope BB comes out with more jelly base glitters like it! I'd love to see a purple version. Maybe a yellow and an orange too! Between you and Katee yall are so going to make me haul some BB Couture. I looooove Sea of Cortez and Poison Ivy. Holy Crap I WANT Dragon's Breath! I'm not even usually a fan of purples this red (I prefer the blues), but OMFG that glitter is awesome. Sea of Cortez is pretty too! Where do you buy them at? Poison Ivy is Fab U lous! You've been a busy girl...never take another day off, ok? Thanks for your tireless swatching. Your nails look crazy beautiful! I love all those colors. I have a book that I write all the colors down that I love. Those lists are getting longer and longer. I've had these on my list for awhile. Thanks again for all the good pictures and polishes that you find. Just curious how you think Dragon's Breath compares to Lippmann Good Girls Gone Bad (from their limited edition set). Any thoughts? Where did you buy these? They're not on BBcouture.com. I must have Dragon's Breath. Was Dragon's Breath renamed Midnight Desire? There is no "Dragon's Breath" listed at the site I went to purchase these but they do have "Midnight Desire" which looks like the same polish. I'm so confused.........I don't see Midnight Desire on the .com, either. Or for that matter, any of the colors that Scrangie posted. What site is everyone viewing these on? Dee, it is, it really is! Katee, me too! I'd love to see those for sure! B, Oooh you should try at least one, they're so cool! Styrch, Well, let's see.... The base color in Dragon's Breath is similar to the color of Good Girl Gone Bad, but that's about it. GGGB is a dense mulberry-brown glitter, and Dragon is a red-purple jelly with sparse multi colored fine glitter. :( I wish I could find a dupe for Good Girl Gone Bad! Just got my order and I must say, Dragon's Breath is more red/pink/plum in real life than what I see on the monitor. I actually like it better. And the name can't be beat.